It was June of 2017, when I had been on my first full-fledged photography tour. This was macro special tour with Vihang. And while on that tour, I came across this term “ODKF”. I had no clue what the full form was but didn’t even have the courage to ask for it (thinking I might be the only one not knowing it in that group). 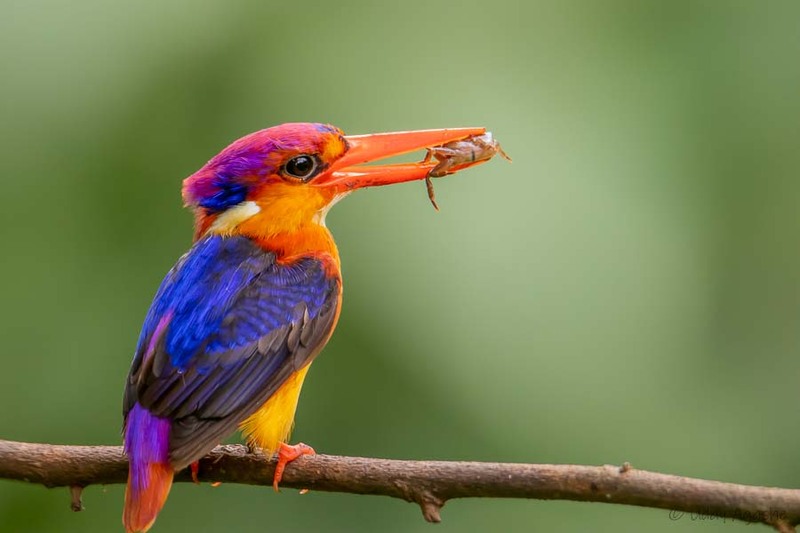 Very close to our stay, there was a nest of this ODKF and experts like Yuwaraj (the authority in India on Macro photography) were very keen to have a look at it. 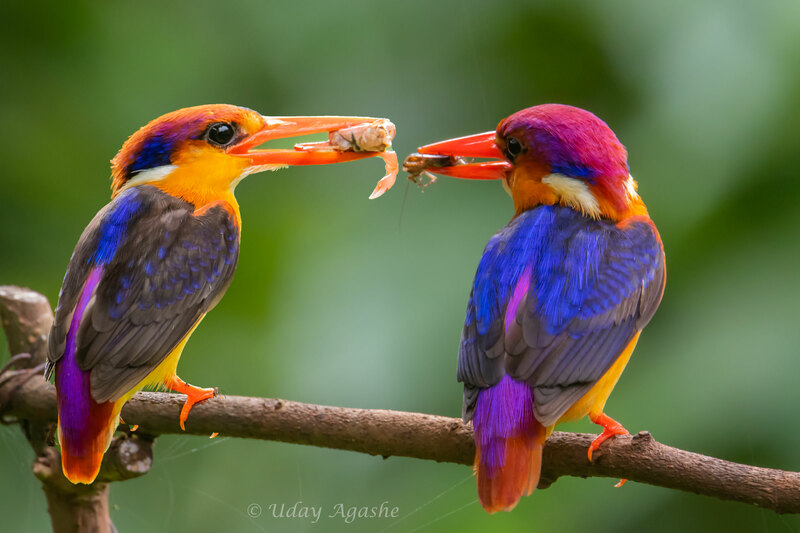 Abhay Kewat (another brilliant photographer) was with us and he alerted us about possible entry of the ODKF. He asked us to remain silent as he had heard the call and was sure it would come on the scene anytime. Although he sounded very confident, I had not heard anything different and my hunch is even others had no clue what he was talking about. But within a few seconds, it did make entry on the perch near its nest. We all tried to take pictures with whatever cameras that we had. None of us was ready with tele-zoom lenses as we were on a macro photography tour. I tried to take a few snaps using my point-n-shoot camera but those were meagerly record shots. One other group was there especially for ODKF and they were ready with tripods and long lenses; we had to satisfy ourselves by looking at their camera screens (दुधाची तहान ताकावर). During that tour and also for next couple of months, I kept hearing about ODKF and lot of my friends did mention about Nandu Tambe in Chiplun being the best person to help. Those were my early days in photography and I could not manage to do any tour there. Come September, the season was already over and I hoped to catch it next year! Once again on Sunday morning, we managed to get a quick photo of the ODKF making round of the nest area (possibly rebuilding the nest-hole). This was promising but it also meant we would have to make another trip here once the eggs are hatched and the feeding activity begins. Within 3 weeks, we actually made another trip to Phansad. This time we were only 5 of us and focus was ODKF. So we were well prepared with the zoom lenses as well as tripods. Very confident about taking good photos as we had already seen the activity around the nest last time. It was raining heavily all thru that week-end but that has no impact on ODKF anyway. It migrates to Kokan region especially in this season, so rain makes no difference to it. That day, there weren’t any other groups in Phansad, so we had all the field to us. Through the day, we kept a close watch on the nesting site but couldn’t see it even once. By close of day, our disappointment was apparent. Besides that, the rain didn’t allow us any major macro outings either. Next morning, we took help of locals and managed to find 2 more possible nesting sites in other part of the jungle. After breakfast, we split in 2 groups and kept watch on these additional sites. Besides that we had made rounds to the original site as well. In all this the rain was incessant but we were determined to get good photos. By 12 noon our hopes were diminishing very fast, we continued to maintain our vigil at the main site till 2pm but there was absolutely no sign of the bird! We had no choice but to start the return journey to Thane. During the journey, I thought of making a trip to Chiplun that was missed last year. I had checked with Abhay but he had arranged all his tours on weekends and that is obviously the most crowded time. Milind (Milind Gogte – a veteran in the field of trekking and photography) had been to Chiplun earlier and he knew Nandu too. So I took the opportunity and asked him about a tentative trip on weekdays. He immediately agreed. Yudhi kaka (Yudhisthir Vaidya – another senior citizen with loads of photography experience) and Himanshu (Himanshu Joshi, one more Vihang co-photographer) who were with us in Phansad also showed interest. Next-day I checked the railway bookings and found a slot on 24-25 July when tickets were available, things started falling in line. Deepa (my wife) also showed interest and so did Himanshu’s wife. Tickets were booked, Milind got confirmation from Nandu and the trip was set! The train journey started pretty early in the morning (5:25am at Dadar) on 24th July, and we reached on-time in Chiplun. Nandu had sent his friend with a xylo and within an hour we were near Shirwal (the place where Nandu has his private jungle). Since it was week-day there weren’t many photographers that day and so we were lucky to have Nandu’s company right from the start. After lunch, he took us to THE location. By the way, no one knows (except Nandu off course) exactly how many ODKF nests are there but he will make sure to take you to the right nest where the feeding activity is on-going. This place was little far-off (may be about 4-5 kms) from where we were staying so we had to use the vehicle again. The nesting-site was a plain-vanilla rice-field, where we had to walk thru the fields on a rocky terrain. After some 200 meters walk, we reached a place that was covered on top with makeshift roof, there were some tree-branches kept in the front (fixed in the soil, allowing only our lenses to protrude outside). There was a narrow low-height wooden-plank for us to sit (on which we sat silently for the next 3-4 hours). Nandu made us adjust there, he helped setup the tripods and camera (without anyone allowed to make any noise) and told us to have patience. We had to leave all our belongings (other than camera and tripod and a water bottle) in the vehicle. His precautions are justified as he does not want people to have food there and then litter it to allow entry of jungle-ants. The reason is, if the ants get near the nest, they would surely smell the eggs or chicks and very likely will attack the nest. This not only will finish the current clutch but will also force the ODKFs to abandon the nest forever. He is obviously very particular about it and won’t allow that to happen at any cost. Well set on our planks, we waited for about 20-25 minutes. Our cameras pointed/focused on the perch that was in front of the nest. And there it was, all of a sudden, no pre-cursor, no sound, it just appeared magically on the perch, making its characteristic movement of the neck (looking out for possible dangers before entering into the nest). Within a few seconds, it went into the nest but that allowed us to take out first snaps. What an experience that was, I had waited for one long year for this, and it looked worth! For the next 3-4 hours, the parent pair, kept on making rounds (every time carrying a prey for the chicks) and we kept on clicking umpteen photos. The intervals kept varying, couple of times they came within 5 minutes gap and at times for close to an hour there was no action. That long wait did test our patience but all that was acceptable since we were getting what we had come here for. We continued there from 2pm to 6:15pm when the light had started fading. We were back to our resting place completely satisfied and happy but our cameras were ready as we could see the common-blue kingfishers and grey-breasted Prinias around. All of us had peaceful sleep that night (ODKF was one reason but the food there was equally amazing, simple veg food prepared at that home-stay was too good to not mention here). Next morning, we were fortunate to see a baby-ODKF, coming out from the nest for the first time that morning. It did give us some interesting poses and was also constantly making a chirping noise, possibly calling mother. The chick had come out from the nest but his siblings were still inside, so we headed for the nest and settled ourselves there. Today the initial wait was long, it came on seen after an hour but immediately made up for the lost time. This time, it was not carrying any prey but was trying to call the other chicks out. And for that reason, it remained on the perch for much longer allowing us to take as many shots (and also changing camera settings in-between). Rather than going into any other details, here are the pictures ..
Word of caution: The pieces below are mostly what I have heard from Nandu (whatever I could understand) and also from other friends/internet. So it is quite possible that some of it is factually incorrect or incomplete. 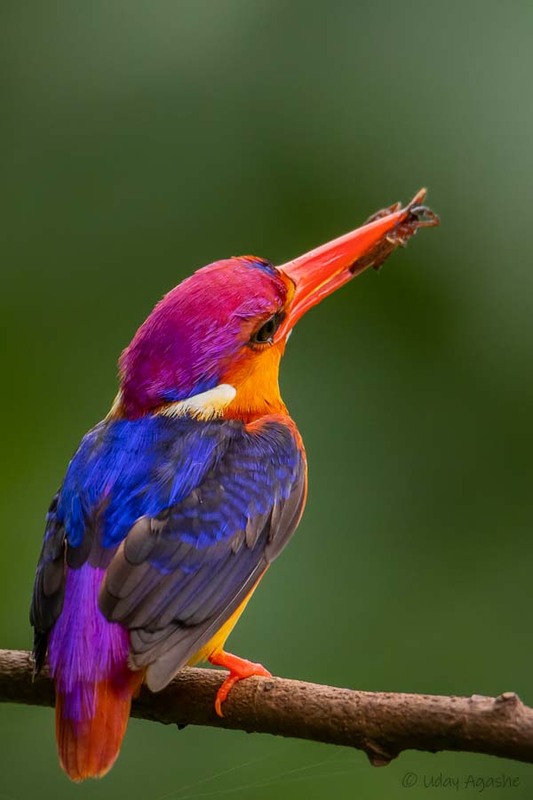 The ODKF nest is a hole inside a soft soil-wall (mostly close to a water-hole or jungle where the kingfisher can find abundant prey base), the bird is about 5 inches in size and the hole is also about the same diameter. It enters in, feeds the chick and comes back to the entrance walking back (there isn’t space enough for it to turn inside). The ODKF is resident of south-Asian regions. Those who come to Kokan area from places like Andamans or Sri Lanka. The ODKF breeds twice in every season. The eggs hatching takes about 17-18 days and a further 10 odd days period for the chicks to learn hunting their own prey. 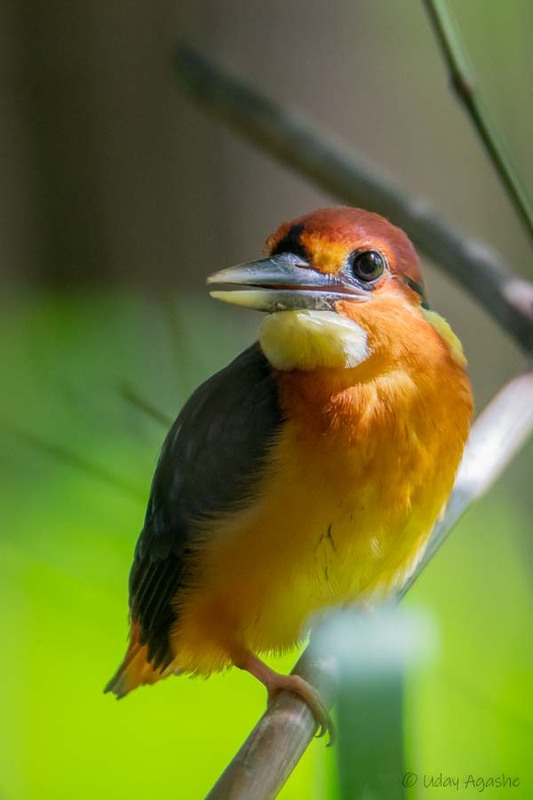 Besides ODKF, there are many other types of Kingfishers that can be seen in India. 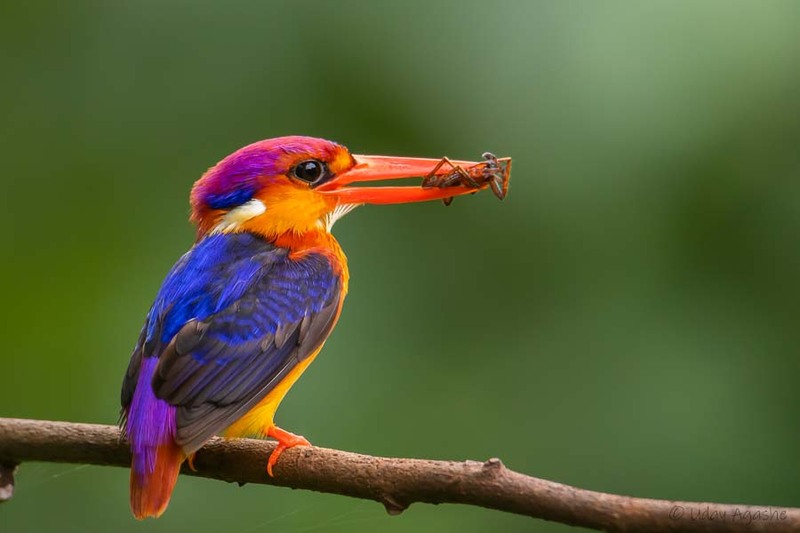 I myself have photographed 8 other varieties (Small blue, White-throated, Brown-winged, Collared, Pied, Crested, Black-capped and Stork-billed) in the last one year, if anyone is interested, I can share the pictures.